Quite some time ago I told you I would tell you about cutting fabric with Cricut machines. I'm finally going to share the tutorial with you. I'm also going to share a bit of a craft fail associated with this project. We all have those some time and I totally had one this time with cutting fabric with the Cricut. I think adding a fun shape to a pillow or some DIY wall art is a great idea and fun way to add some whimsy or cuteness to a project. The problem for me is that I stink with both the patience and the skill set to cut out designs from fabric. Since I have a Cricut, I thought it was time to figure out how to cut fabric with it. It can do the work and I can enjoy cuteness. 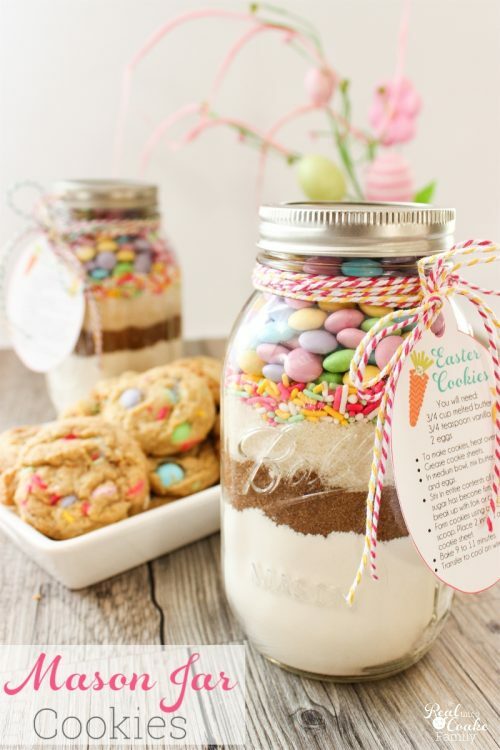 Not much patience needed…except if you turn a project you know how to do and have done in the past into a craft fail. There is always that! Lol! 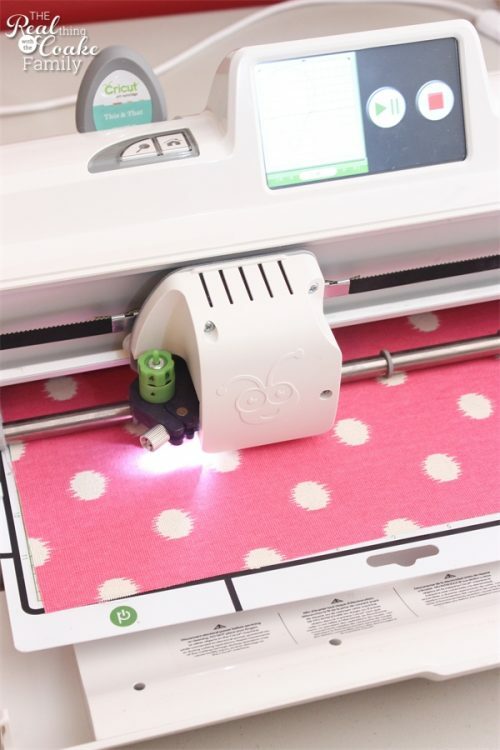 (affiliate link) has some specific settings for cutting fabric, but I haven't shelled out the money for the latest and greatest Cricut yet. Until I do, I will use this method. Above, I thought I could cut out fabric on the Cricut and not use Heat n' Bond. I prefer to find low or no chemical ways to do things. I decided to try to stiffen my fabric with Mod Podge. I thought that if the fabric was stiffened it would cut fine on the Cricut. 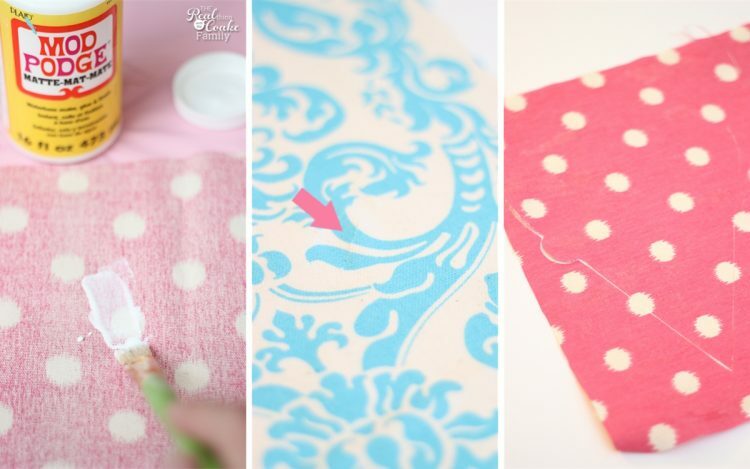 You stiffen fabric with Mod Podge by adding a layer of Mod Podge to the back side of the fabric. I did that and waited for it to dry. I adhered the Mod Podged side, or wrong side, of the fabric to the cutting mat and gave it a try. You can see in the middle picture above, it barely cut anything. I have an arrow to the one part of the fabric that got slightly cut. Then the fabric started sliding around on the mat. I had to stop that cut. 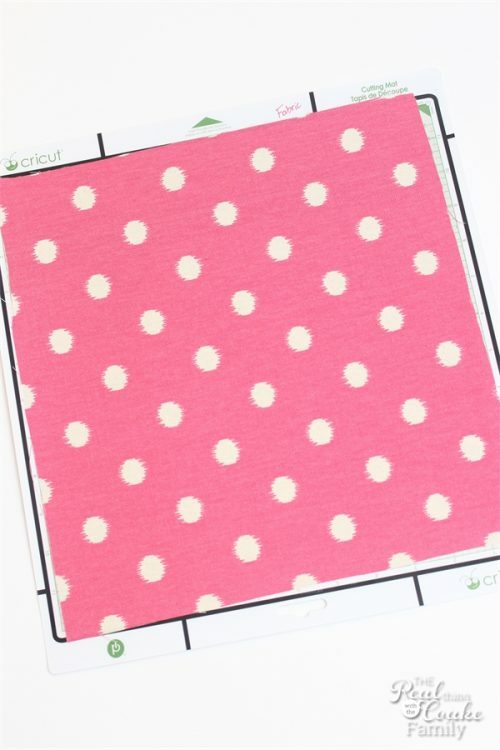 I tried again with the polka dot fabric. I thought that if I set the blade to double cut it might work better. I also made sure the fabric was really stuck to the mat. As you can see in the picture on the right above, this cut worked better, but on the second cut the fabric started slipping around again. So frustrated! Of course, it was late at night and I really needed to get this done. I had deadlines to get us on the road on our big trip. I gave up on this method and went for the tried and true method. 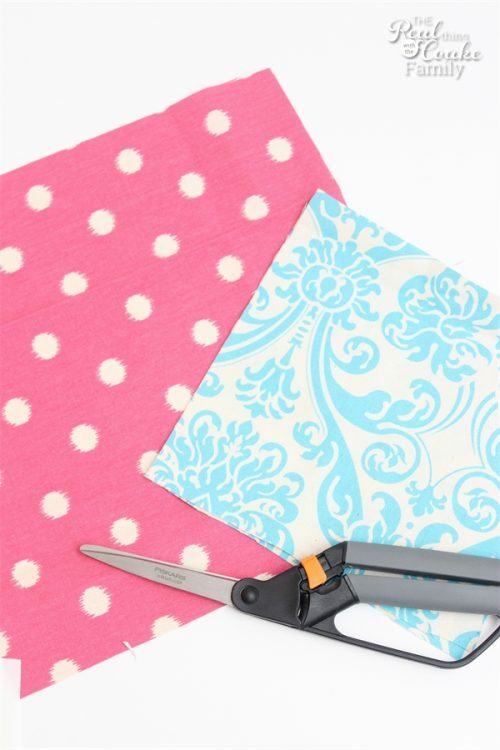 Start by cutting your fabric to the approximate size you want your shape to be. This will save fabric and Heat n' Bond by using only about the size you need. 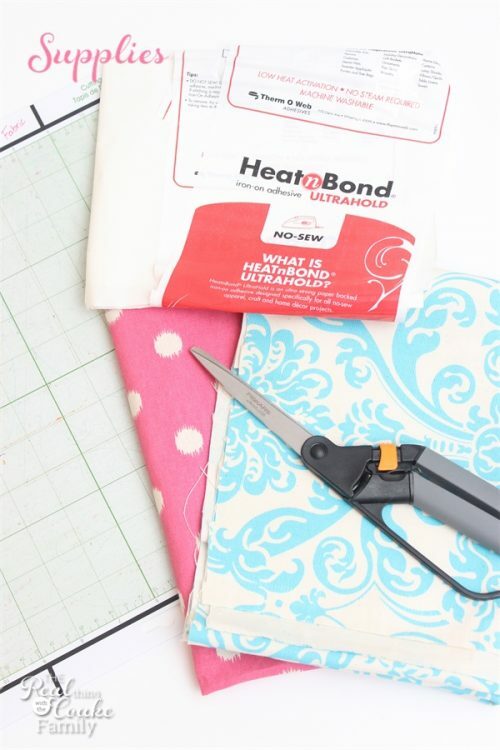 Now, if it is late at night and you are just grabbing the Heat n' Bond you have on hand to complete a project before you head out-of-town on a cross-country journey, I just want to let you know that Cutting the Heat n' Bond into small strips that will fit on your piece of fabric will work. I know you probably plan ahead better than I do so this won't happen to you…but just in case, now you know. Small pieced together strips of Heat n' Bond will work for this project and it will save you money. Use an iron and follow the directions of the Heat n' Bond to adhere it to the wrong side of the fabric. 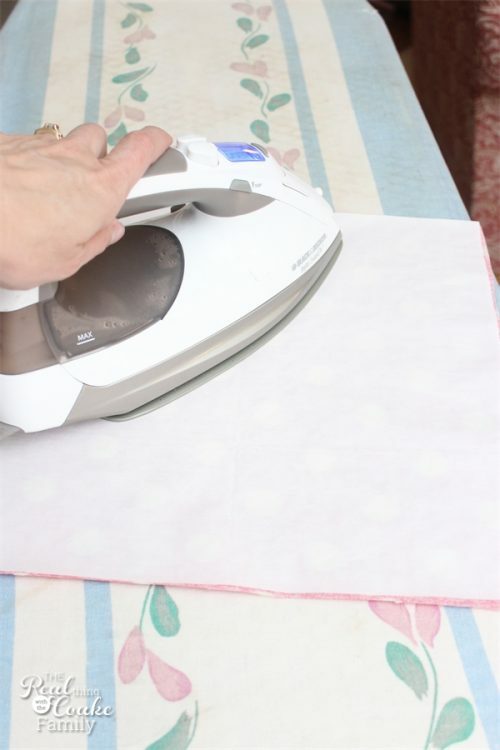 If you happen to have thrown the directions away (ehhm…not that I did that), the iron should be at your cotton setting or hotter works as well. Let your fabric cool down. 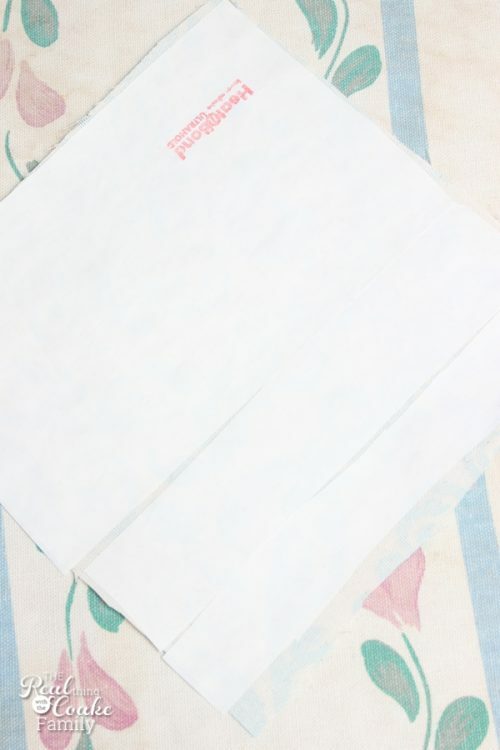 Remove the paper backing from the Heat n' Bond. You will now see that the wrong side of your fabric has a shiny surface. Place the shiny side of your fabric (with the Heat n' Bond) down onto the mat. The right side of the fabric should be up. 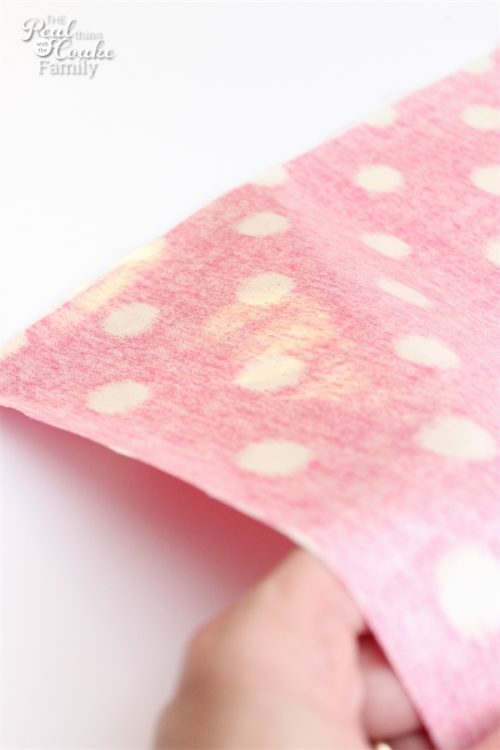 If needed, you can use a roller or a brayer to get the fabric flat with no bubbles. Program your Cricut for the size, shape and cut you want. I have the Cricut Expression 2. I have had success cutting fabric out two different ways. This time, I used the settings you can see above. The blade was on 4, speed 3, depth 5 and set to cut once. Though with this thickness of fabric I had to set it to double cut. This fabric was a duck cloth. The last time I cut fabric on my Cricut I was using a cotton fabric that was thinner. For that cut, I used the blade on 4, speed 4, depth 5,set to cut one time settings with success. 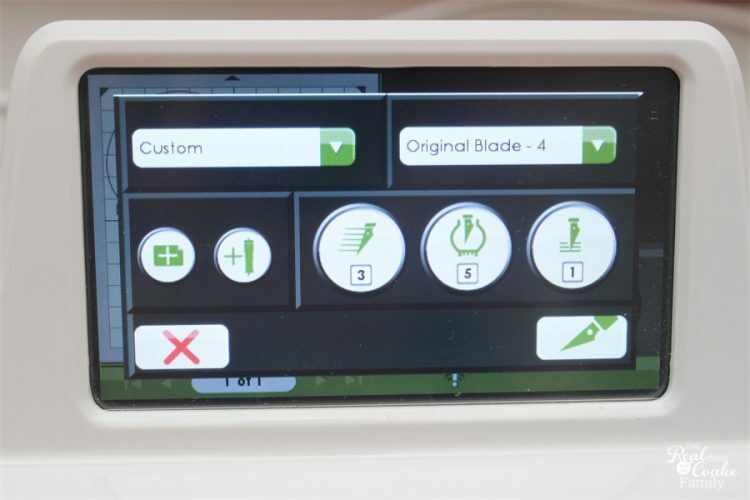 Hit the cut button and let the Cricut do the work. Carefully remove your fabric from your mat. In my case, with the duck cloth, I had to do a little bit of trimming, but it worked. Yay! Late night craft success! All you need to do now is iron the shape to your final project. I added my shapes to some cute summer pillows I made for our living room. I've also used this to same method to cut out an applique I added to some reversible placemats I made. Sign up for my free member program, not only will you get notified every time I have a new post, you will also get some fun free organizing printables. Thank you! I find it simply amazing that people can cut shapes out by hand. More power to you! Thank you so much for sharing this! I had a fabric cut fail with the Cricut too and had to cut out a cardstock template then trace around my fabric, so it is good to know that there is actually a better way. I’m so glad you found it helpful! I can’t imagine having the patience to trace and cut…kuddos to you! 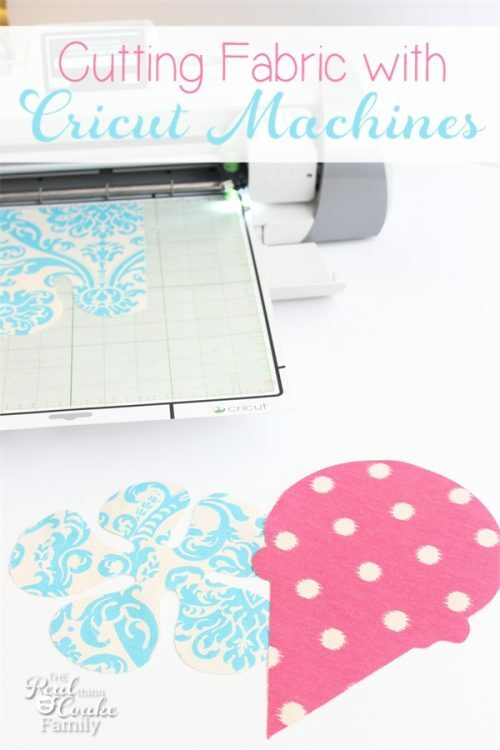 I am FINALLY planning to use my Cricut to cut some fabric! I wanted to create some bibs & burp cloths as gifts for some special babies. Maybe I’ll make a quilt later, but I’ll start here. Thanks for the info!! I’m considering the Cricut for appliques but wondering if it would also cut marine vinyl? Once you input the shape you want, can the shape be enlarged a bit? This would make all my cutting tasks so much easier. Thanks! I’m not sure what marine vinyl is, but I cut adhesive vinyl with it. You can absolutely enlarge the shape as well as even change the shape in some ways before cutting. It makes cutting things a breeze! I got the newer Cricut and I LOVE it even more than the one picture in this post. It is a breeze to work with. Hope that helps! Once again – thank you so very much. I have the Cricut Explore. I highly recommend it. I like it tons better than the older model that I had. Sorry for the delay in responding to you. My girls and I are on a 5 week road trip…it is fun and it makes it hard to keep up with work, but I try. I looked at the marine vinyl. It is what I was thinking of. I’m not sure if the Cricut can cut it or not. It is thicker than the vinyl I cut. Try doing a quick Google search, I am sure if someone has cut the marine vinyl with it, there is a post or a video on how to do it. Have fun! Thanks for all the information – enjoy your vacation, it sounds wonderful!! Family times are the best. Thanks! We are enjoying our trip. Can you iron right on a pillow? I have the Cricut Explore Air and also have a Cricut Expression2. I would like to cut some large flowers from burlap. I have Steam-A-Seam2. 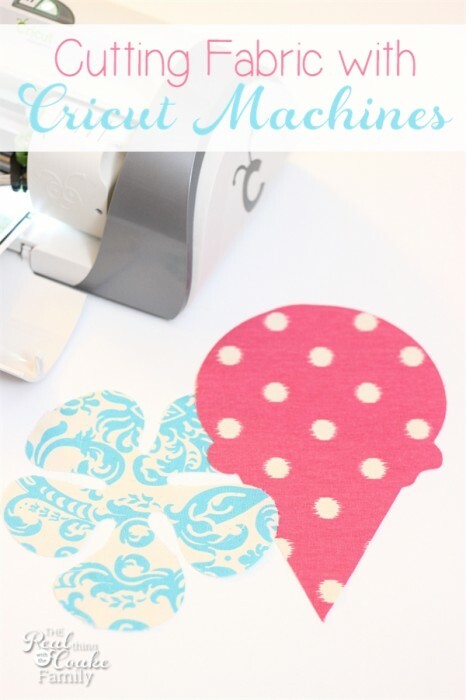 Have you cut burlap with your Cricut? Thank you! I have not cut burlap. I would think it would depend on how tightly woven the burlap is. My guess is that a tighter weave might work, but it also would shed so much that it may gunk up the blade and the machine. I’d love to hear what happens if you give it a try. Good luck! I make baby quilts with the baby’s name, stats, etc. on it. Does the machine cut out letters, numbers, etc.? I have a Cricut Expression 2 that I am still using. Are you using the Deep Cut blade and housing set when you cut fabric or your regular housing set/blade? Hope I get an answer. It is hard to find people to ask Expression 2 questions! Nope, I just use the regular housing set/blade. Hope that helps!